You can't really misunderstand that look, can you. You don't need to be a body language expert. Not breaking down in tears or uncontrollable rage??? What, from someone who took all of twenty-four hours to 'forgive' the thug who had just killed her remaining child? And it's OK to describe Mahon as a killer, he's admitted it. It's hardly surprising she's getting hard stares from other mourners. 1.... It is known Amy went missing after returning home after a NYE party.. For three days the so called mother , decided not to call the Police...personally I would have done after an hour or so. THREE DAYS, were they too busy cleaning up or concocting alibis?? Drink fuelled argument that got out of hand maybe?? 2..... Amy has never been found..Plenty of witnesses have said what a horrible life she led in Spain, and how she wanted to return to Ireland to be with her father... Obviously where she was more happy, as not to often daughters want to live with their fathers. What did she want to escape?? 3..... Dave obviously has a problem with his temper, what is the betting he lost it with Dean?? Why hide a weapon used, if it was an accident?? If it was, as suggested an accident, why have a knife IN A STAIRWELL??........ NOT AN ACCIDENT. Why have two friends to talk as well?? 4.... Did Dave know Dean was going to the Gardia with the information, more importantly did Amy's mother know this?? One of these, or maybe both of these people knew he was going there. 5.... Took a whole for Dave to hand himself in...an accident, is that an accident....You stay with the person you hurt, until help arrives, not run off and hide. I don't expect much to happen, police-wise, till after the funeral, muratfan - the police will doubtless be keeping a very close eye on that. IMO, Mahon is heading for a jail cell, and possibly Audrey too, depending on what comes out of all this. I mean, Dean gets killed by Mahon 'accidentally' when he's about to speak out; Amy 'vanishes' having been prevented by Aud'n'Dave from returning to Ireland and her real family. First thing teenagers pack is their phone and charger...sod clothes and anything like that, but phone and charger.. I suspect the phone lines will be busy between Dublin and Malaga police, muratfan - Amy and Dean's real father must be beside himself with grief and anger. The mother of stabbing victim Dean Fitzpatrick was unable to attend his funeral this morning due to illness. Audrey Fitzpatrick became unwell last night after attending her son’s removal at the Church of the Holy Trinity, Donaghmede, north Dublin. The 23-year-old father of one was stabbed to death at an apartment in Northern Cross, Malahide Road, north Dublin, last Saturday week. A dispute over the funeral arrangements had arisen between his separated parents. The High Court last week released his remains to his partner. Dean Fitzpatrick’s stepfather Dave Mahon was named during last week’s court hearing as a suspect and he has been questioned about the fatal stabbing after presenting himself to gardai. Mr Mahon did not attend the removal mass yesterday evening. The deceased was a brother of Amy Fitzpatrick, who was aged 15 years when she disappeared in Spain in 2008. She and her brother had gone to live there four years earlier with their mother and Mr Mahon. Mahon worried in case she says something she shouldn't, when he's not around? 'Suggest' she shouldn't attend the funeral of the son he killed? Mind you, her absence was probably a relief to the genuine mourners who aren't able to forgive killers quite so quickly. Impossible not to get the impression that the Irish press don't believe a word of this, and also have a fair idea where the police investigation is going. Isn't there a strange silence in certain quarters about all this? If Gerry McCann had as much as got a parking ticket, there would be 100 page threads about it. But - not a word about this. How odd. Or maybe not. Very strange. Picked the wrong horse did they, in pursuit of abusing The McCanns? They seem to do quite a lot of this. They really went the extra mile with Aud'n'Dave, muratfan - if and when the investigation into Amy's 'disappearance' is restarted, I suspect one of the things the Spanish and Irish police will be taking a very close look at is the Aud'n'Dave fund. Just what was that for? We all saw the absolutely vile abuse the supporters of those two hurled at anyone on the internet who even sympathised with Amy and Dean's real father, never mind question the story spun by Aud'n'Dave. So, lots of questions to be asked - and hopefully, answered before too much longer. The Irish Police would be mad not to look into Amy's disappearance after recent events. The thing is though that Dave might have thought it better to shut Dean up rather than run the risk of him talking. Who knows? Mahon seems to have been awfully keen to see Dean, what with the two phone calls. And then, allegedly, when Dean arrives, Mahon's got two other guys there - and stabs Dean to death in 'self-defence'? I don't believe a word of it, personally, it looks more like an ambush. Well, he needed witnesses, didn't he. That's why he had to have two to say he was innocent. One wouldn't have been enough. And besides, Dean might have won. Allegedly. Tainted witnesses anyway since they were there with Auld Dave, so they will not be relied upon. Maybe not, but difficult to prove if all three of them stick to the same story. If the story is spot on with all three, then the Police will know it is a put up story... Everybodies account of versions is different, the Police and Prosecutors pick through to see where the corroborating evidence is. I could tell you what they could say, but I'm not going to because I am certain they are reading here and waiting for me to tell them what to say. Coo ee, Dave. Make up your own story. Mahon will have to explain why he was so desperate to see Dean, as Dean couldn't stand him. Which might be difficult, as Dean seems to have been confiding in his real father. And who knows what Dean has told his partner? SEVEN snow white doves were released at the graveside of Dean Fitzpatrick, as his partner and tiny son looked on in grief. The father of one, who died after being stabbed last Saturday week, was remembered during his funeral for his "big smile", his energy and the love he had given his son, partner, family and friends. 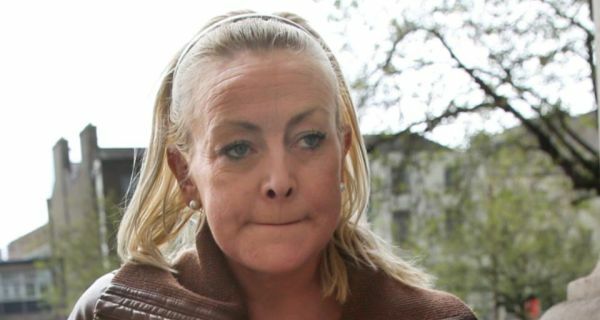 Dean's mother, Audrey Fitzpatrick, was not present amongst the mourners at the Holy Trinity church in Donaghmede, north Dublin. She had become ill after attending the removal the previous evening. However, later the ashen-faced mother and her partner, Dave Mahon, were spotted leaving their apartment at Northern Cross on the Malahide Road and getting into a taxi outside the nearby Hilton Hotel. Asked if she intended to visit her son's grave, Audrey replied: "I don't know what plans I have at the moment. I just can't talk about it now. "I wasn't feeling well this morning," she added. Mr Mahon has admitted inflicting the fatal stab wound at his apartment at Northern Cross, Malahide Road, on May 25. He has claimed he had acted in self-defence. Around 200 people attended the funeral, including Dean's girlfriend Sarah O'Rourke, and their son, Leon, who will be two in August. He was comforted by Dean's father Christopher and step-brother Alex, his aunt Chrissie, uncle Billy and extended family and friends. Symbols of the young man's life were brought to the altar, including a baseball hat representing his love of fashion, headphones for his love of music, a miniature bicycle for his love of cycling, a small weight for his love of the gym and a cross representing his faith. Parish priest Fr Eoin McCrystal acknowledged the devastation felt at Dean's death, commenting that he was a young man with so much of life ahead of him. Dean was a proud father of Leon and doted on him, he said. He said Dean had also experienced tragedy in his young life when his young sister Amy went missing over five years ago. "That must be the worst nightmare for any family, and Amy is very much in our prayers this day as well," he said. Later, Dean's friend Kevin Harris paid tribute to him, recalling the "big smile on his face", and how full of energy he was. He recalled the day that Dean came home from Spain with an "accent", having lived there with his mother and her partner. "It was great to have him back," he said. He said Dean had remained great friends with his mother, Audrey, and had been "so proud" to be a father. He was also "a very good partner" to Sarah, he added. Christopher Fitzpatrick carried his son's coffin from the church, assisted by family and close friends. Seven white doves were released in a poignant tribute at the graveside at Fingal cemetery, bringing back memories of a previous occasion when white doves were released in memory of all the years Amy has been missing. Afterwards, an emotional Sarah planted a kiss on her little son's face. And to the heartfelt words of 'Read All About It Part III' by Emeli Sande – one of his favourite songs, the remains of Dean Fitzpatrick were finally laid to rest. She seems to have made a very rapid recovery from her 'illness' and Good Old Dave looks as if he hasn't a care in the world. Unbelievable. The poor little boy.